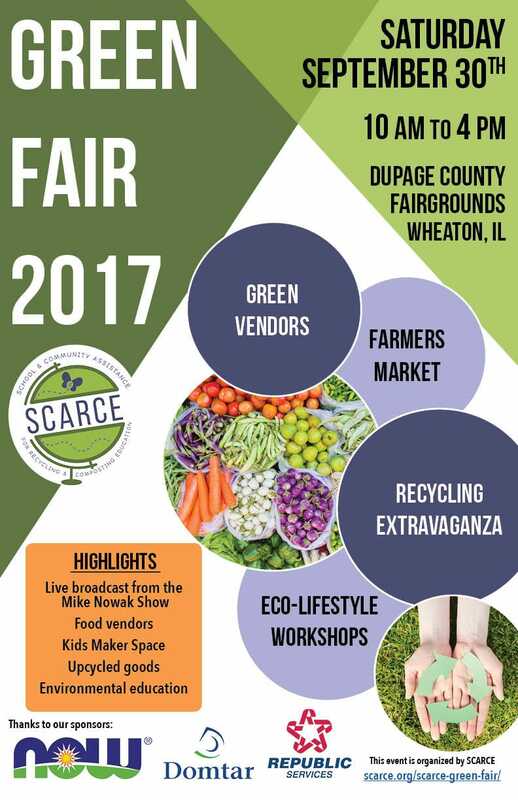 The annual SCARCE (School & Community Assistance for Recycling and Composting Education) Green Fair is Saturday, September 30, 2017 at the DuPage County Fairgrounds. $5 admission, kids 15 and under free. The Green Fair has activities indoors & out so come by rain-or-shine. New this year: Recycling Extravaganza, Farmer’s Market, Beekeeper Presentation, Environmental Speakers, Upcycled Maker Space for Kids and more! This fun, all-ages event will feature eco-friendly vendors, STEM/STEAM activities, and plenty of food to keep you fueled!